Halloo - How do I configure the auto attendant for my account? How do I configure the auto attendant for my account? Halloo Office and FlexCall Manager plans are activated with an Auto Attendant assigned to the main extension ‘00’ (or 000/0000 for 3- or 4-digit plans). The telephone number assigned to your account will be directed to this main extension so that your callers will be greeted by the first auto attendant menu. To customize the attendant, sign-in to the My Halloo Web site as an administrator. Select the All Extensions link at the top of the page and click on the 00 (main) extension to make modifications. Here you will be able to set up your menus and related events. 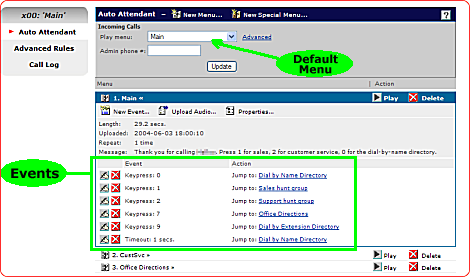 Events can be triggered by keypresses or timeouts (no action by caller), and result in action, such as “jump to another menu”, or “transfer to a user extension”, or “hangup”. In the above example, menu Main plays a pre-recorded greeting message, and listens for keypresses 0, 1, 2, 7, or 9. If the user does not respond after the message is played, the timeout event is triggered. Events may consist of single digit matches, (e.g. “1”) or complex strings (e.g. “15323”). Note that the shortest string will always match first, so you cannot have an event for both “15” and “153”, as the latter match will never occur. You may also set up hidden options, by simply omitting the mention of the option in the outgoing message part of the menu. For example, you could set up an event “12345” to jump to a secret menu for employees, or perhaps direct customers to jump to a special promotion page. Repeat — Play the audio message this many times before hanging up. The system will immediately stop the audio if a keypress is detected, and jump to the appropriate destination. Message — Say the following when this menu is played. Note that the message you type here is converted to speech by the system. This computer generated audio file will give you an idea how your system sounds as you create your menus and fill out your system. You should replace this audio with a human recording to make your system sound better. You can record this yourself or order a professional recording from Halloo. To edit and manage existing menus, click on the title of the menu you want to edit from the menu list on the Auto Attendant page. The menu will expand, allowing you to edit events and other parameters associated with the menu. Click on New Special Menu… to create a Dial-by-name, Dial-by-address, or Hunt Group. These menus are created and added to the bottom of your Menus list. After you create your menus, add Events to connect them together and to direct your callers through your system. Each menu will have its own unique set of Events. Open a particular menu and click New Event… to create a keypress or timeout event. Detailed instructions for configuring the attendant can be found in the help file, which you can view by clicking on the button. Solo Plan users can also request creation of an Auto Attendant by going to the My Account link on the My Halloo website, and clicking the [Change Plan] button to upgrade to an Office plan.